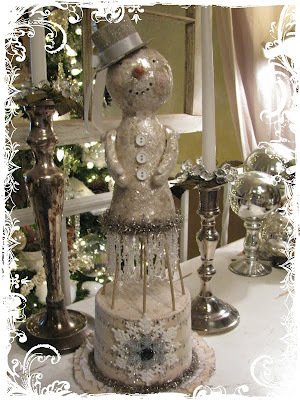 **My Desert Cottage**: Vintage style Snowgirl. She is just precious, Karen. I am so glad you took her out of the drawer to finish her. Sometimes we just need a little time and space for the inspiration to come. Wonderful!! Hi Karen .... I just love, love, love your snow 'person' ... It made me pout cuz I have not had time to make anything this year .. I love snowmen and always think I'll just make some during the year ...but of course it gets put on the back burner ... I'm so glad you finished her and yes I think she needs a 'snow guy'. Absolutely stunning! Aren't you glad you pulled her out of that drawer? She is wonderful! How did you make the hat out of chipboard?? She is gorgeous! So glad you shared her with us. Sometimes it takes a while for all the inspirition to get there. You did a wonderful job. Oh, I just love her! Can't wait to see the brother! So sweet! I love the look of your blog...so pretty and soft. Such a beautiful creation.. Thank you for sharing all your wonderful christmas creations.. I love your Home.. It looks like such a warm and cozy place. Happy Holidays to you. She is so cute! I think a twin brother would be wonderful. Can you fit that in before Christmas? Which is one week from today! YAY! Well you have made a beautiful snogirl from something that did not start out the way you wanted. Looks so vintage too. your snowgal is just adorable!.. your home is so lovely and festive !.. Love reading your blog.. Very clever! I love her Santos looking skirt! Happy Christmas! Now Karen, that's what I call perserverance! And, look how pretty she turned out to be. I love her and I have a feeling that by this time next year, she will have a brother. She is darling. Karen.....look forward to seeing her brother next year! Karen.. your work, your home..everything is simply stunning! I'm loving this "snowgirl". You don't see many and especially not done up so pretty. Well rock ON, sister! Way to go! She is lovely indeed! Oh Karen, what a cutie she is!!! It was such a great idea to create a wooden skirt for her. She looks awesome! She is beautiful! I told "the girls" about her, :) and they were thrilled that they could help her come to life! That one is going to be difficult to put away after the Holidays! Girlfriend this is just gorgeous! I totally love it! Pretty Karen! Oh so Pretty! Funny how some things just don't work in the beginning but, after you think & work & re-work... Presto a treasure is born. I agree with the next year part. This Christmas seems to be sneaking up pretty fast doesn't it? Have a great weekend. Like I have said before, you are one talented gal!! The snowman is stunning. She is beautiful, just plain ( although there is nothing plain about her ) beautiful! What a sweet snowgirl - she is sparkly and cheery. How much fun it was to make her, now you have a whole story to tell about her every year when she makes her appearance! I LOVE reading your blog!. This snow gal is adorable.. I will be in Phoenix SOON to come take 3 days of Terri Brush's art workshops, I signed up thru Melrose Vintage! I heard they are the best classes ever..maybe I will see you there!.. She also does neat paper mache stuff too.. I love her Karen. She is adorable. How cool is she! Love her; very original and special! Oh I love Snow People and yours is fabulouss! What a happy accident, she is lovely! I think she is more unique with her Santos skirt than if she had been a regular kind of snow girl. Happy Holidays! All of your love and caring really shows in how gorgeous she turned out!! You are truly talented girl! Have a wonderful Christmas with your friends and family! Oh my Karen, she is just beautiful! I'm so glad that this pretty little thing is no longer hanging out in a drawer, and I love how you have finished her off! What a lovely idea! Your home is such an inspiration and your holiday decor has just made my holiday experience so much more enjoyable this year.